"This book breaks the mold...by taking the reader through the entire spectrum of the distributed object approach, from requirements analysis through systems development, with a thorough treatment of relevant standards." 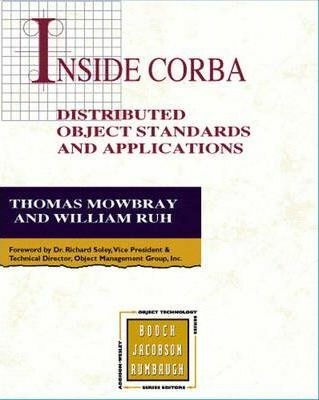 -Dr. Richard M. Soley, Technical Director, Object Management Group Inside CORBA is a comprehensive and authoritative guide to distributed object architecture, software development, and CORBA (Common Object Request Broker Architecture) standards. CORBA is a consensus standard from industry that has transformed the way information systems are developed, both for creating distributed object-oriented systems and for migrating legacy systems to modern architecture. This must-read for all managers, architects, and developers of distributed systems begins by addressing the key organizational challenges to the adoption of CORBA and the essential management guidance necessary to ensure its success. Following this introduction, the authors present a user guide to the CORBA standards, complete with examples of their application. 1. An Introduction to Corba. Information Systems: From the Back Room to the Front Office. 2. Corba Interface Definition Language (Idl). The Most Significant Element of Corba is the Interface Definition Language. Omg Idl is a Stable Standard. One Idl File Creates Multiple Language Bindings. Idl is Pure Specification, Not Implementation. The Quality of Idl Designs is Critically Important. The Dynamic Idl Type Any. Conversion of Oo Designs to Idl. From Oo Design to Idl Example: Course Registration Object Model. 3. The Corba 2 Standard. An Overview of Corba 2. Corba Clients and Object Implementations. Interface Repository and Idl Object Models. Applications of the Interface Repository. Variable Type and Pointer Type. Rely On the Corba Standard, Not the Orb Products. Many Application Developers Have Reinvented the Corbaservices. Considering Vendor Support; Self-Building These Services. Internationalization and Time Operations Facilities. Vertical Corbafacilities and Related Activities. Business Object Framework and Common Business Objects. Printing and Method Facilities Input. 6. Relationships With Other Technologies. Choosing a Distributed Object Architecture. The Underpinnings of Distributed Architectures. Microsoft's Distributed Component Object Model. Javasoft's Java and the Remote Method Invocation (Rmi). Issues in the Effective Application of Corba. 7. The Corba Migration Process. Migrating to a Corba Architecture. Conformance Between Architecture and Implementation. 8. Corba and Software Architecture. The Role of Architecture in Software. If Software Architecture is so Important, What is it? The Elements of Good Software Architecture. Models of Use for Corba in a Software Architecture. Applying Corba to Software Architecture. The Scope of a Software Architecture. The Major Entities of Software Architecture. Customizing the Software Architecture to the Organization. The Process for Software Architecture Design. Defining the Software Architecture Objects and Interfaces. 9. Application Design Using Software Architecture. The Relationship of Architecture to Program Planning. Applying the Software Architecture to Application Design. Making the Most of Inheritance. Test and Evaluation of the System. Corba in the Operations and Maintenance Phase. Measuring the Progress of the Software Architecture. Tying it All Together: Architecture and Application Design Processes. Collaborative Processes for Architecture and Application Development. Corba Architecture Process-the Analysis Steps. Corba Architecture Process-the Definition Steps. 10. Corba Migration Case Study: The Information Access Facility. Do Not Design in a Vacuum. Appendix A. Omg Idl Grammar. Appendix B. Omg Idl Definitions From Corba 2. Appendix C. IDL for Corbaservices. Appendix D. Guide to CORBA Resources. William Ruh is CTO and senior vice president of services and solutions at Software AG. A frequent presenter at technical conferences, he testified before the U.S. Senate as an expert witness on technology.